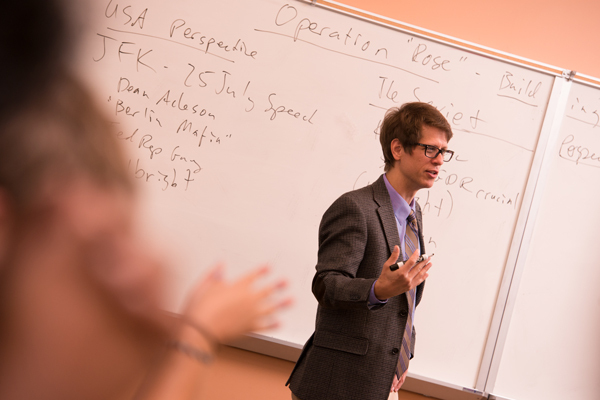 Assistant Professor or Transnational Studies and Westminster’s Study Abroad & Off-Campus Programs Director Jeremy Straughn was recently interviewed by personal finance web site Wallethub.com. Along with other commentators from Wheaton, Colby, Tufts, Quinnipiac, Kent State, Princeton, Harvard, and several other respected universities and colleges, Straughn offers his comments on patriotism, civic responsibility, and global engagement. Specializing in political and cultural sociology, Dr. Straughn is the author of numerous peer-reviewed articles on with national identity and political attitudes in Europe and the United States. He is currently writing a book on social memory in the former East Germany. Straughn was also interviewed last November for news stories that appeared in USA Today and the Nikkei Newspaper on Winston Churchill’s Sinews of Peace address (delivered at Westminster College in 1946) . The July 4th commentary on patriotism marked his twentieth media appearance. Click here to read Straughn’s take on what it means to be a good patriot, global citizenship, and more.